In the SCHAUFENSTERJUNGE KUNST, Alexander Janz (*1994 in Villingen-Schwenningen) presents the participative installation “OFF,” developed especially for the Galerie Stadt Sindelfingen. Janz’s artistic practice engages with conditions of reception and perception. Visitors are invited to sit on beanbags before a large screen. 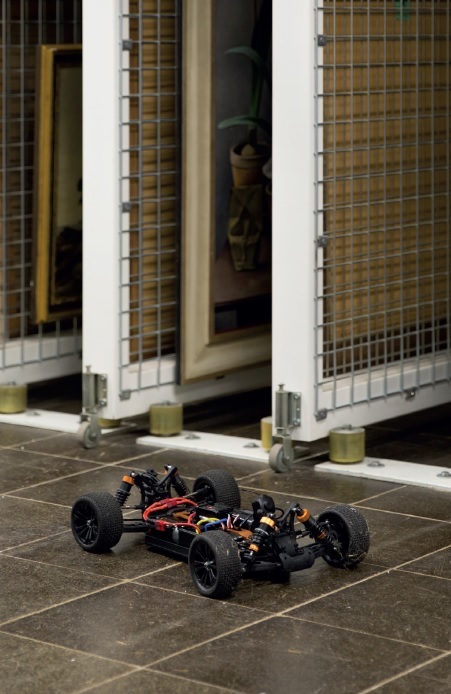 Next to this, a remote control sits waiting, with which a model car can be controlled. This model car is located in the gallery’s depot and as such is not visible. A camera mounted upon the car relays pictures from the depot, which are then projected in real-time onto the screen. Through their autonomous navigation of the vehicle, visitors can embark on a journey of discovery through the museum’s depot. With OFF, Janz thematizes a typical exhibition situation: A museum’s public areas, here visible even from outside through the museum’s display window, are always accessible. Here, visitors may move about freely and engage with the art on show. Access to the depot, however, is refused to those outside of the museum’s staff on the grounds of security and climate-control. Through the participative installation, an interplay is begun between the visible and the invisible, and between those areas of the museum that are accessible and closed-off. Alexander Janz (*1994 in Villingen Schwenningen, lives and works in Braunschweig) is a student, since 2012, at the Braunschweig University of Art (HBK). In 2016 he was the recipient of a DAAD scholarship, spending five months studying at the Institut Teknologi Bandung in Indonesia. He subsequently spent an exchange semester studying at the Malmö Art Academy in Sweden. His exhibition at the Galerie Stadt Sindelfingen is his first institutional exhibition. The exhibition and the SCHAUFENSTER JUNGE KUNST are supported by the Helmut Fischer Foundation. Saturday, Sunday, public holidays 10:00 a.m.–5:00 p.m.